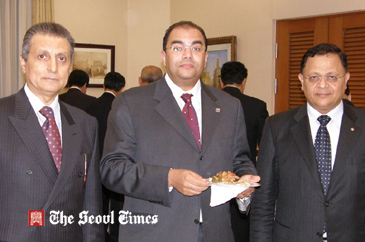 Egyptian Minister of Investment Mahmoud Mohie Eldin (center) poses with Egyptian Ambassador to Seoul Reda El-Taify (left), and Minister Plenipotentiary Ihab Tahoon of Egyptian Embassy at its embassy in Seoul on Dec. 9, 2008. Egypt and South Korea will boost cooperation in energy and construction, officials of the two government said on Dec. 9, 2008. Egyptian Minister of Investment Mahmoud Mohie Eldin met with his South Korean counterpart Kang Man-Soo and agreed that the two nations will expand bilateral cooperation in all areas deemed to be mutually beneficial. Minister Eldin held a one-on-one meeting with Minister Kang at the government complex in Gwacheon south of Seoul on the day. During the meeting the two officials emphasized the importance of cooperation in energy development, construction, finance, and information telecommunications in particular. At 7:30 p.m. on the same day Minister Eldin and his business delegation attended a reception thrown by Egyptian Ambassador to Seoul Reda El-Taify. Meanwhile, other high level officials of Egyptian Ministry of Investment visited the main office of "Good Morning Shinhan Securities" on Seoul's Yoido area. Minister Eldin and his dozen-member business delegation visited Seoul for three days from Dec. 8 to 10, 2008. During his stay in Seoul Minister Eldin also held a investment seminar at Korea International Trade Association (KITA) in Samseong-dong, Seoul. He met with South Korea's other major government officials and business leaders during his stay in the nation. Minister Eldin was accompanied all the way by Minister Plenipotentiary Ihab Tahoon of Egyptian Embassy in Seoul.